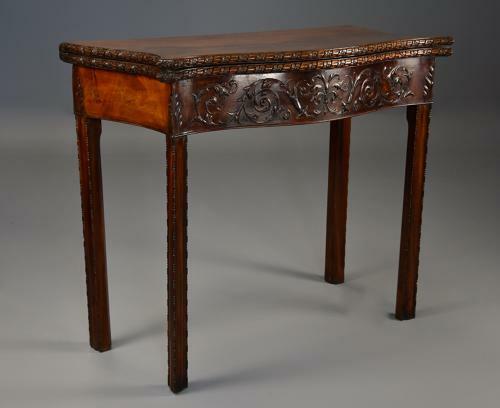 This table consists of a serpentine shaped finely figured mahogany top of fine, faded patina with carved floral and ribbon moulded edge. The top opens to reveal the original green baize surface with mahogany cross banding to the outer edge. This leads down to a finely carved frieze consisting of scrolling floral and foliate decoration, the sides of fine quality veneers with carved leaf decoration to the corners. The table is supported by four square moulded legs with carved broken ball bead decoration and are chamfered to the back.